With many new features that come with every new version of iOS, iPhone storage space easily gets full due to the files these apps and features accumulate in the device. Some of the junk files that are left behind by these new features include temp files, app caches, Safari cookies, app crash logs, YouTube video caches, downloaded temp files, photo caches, user storage files, iTunes radio history, and other useless files. To delete junk files from your iOS device, you can get a cleaning tool that will be effective in removing these needless files from your iDevice. A prominent cleaning tool used for clean up iPhone space is Coolmuster iOS cleaner. However, there is a handy alternative to this tool, which we shall be discussing as an best alternative to Coolmuster iOS cleaner later in this write-up. What is Coolmuster iOS Cleaner? Coolmuster is an iOS device-cleaning tool that promises benefits to the prospective users. This app guarantees to clean up space on your iPhone. It also deletes many types of junk files from your iDevice, frees up iPhone storage space after scanning, optimizes iOS performance by deleting Safari caches, useless messages, duplicated contacts, long-forgotten notes, private information, Safari bookmarks, and offers user friendliness. Coolmuster iOS cleaner may be handy for those who just want to clean their phones with no regard to the data that is being removed or sources from which such data is removed. Therefore, not giving the user an option to choose what data they want to erase, is the biggest disadvantage of Coolmuster iOS cleaner. iMyFone Umate iPhone Cleaner for Win/iMyFone Umate iPhone Cleaner for Mac is the most reliable iOS device cleaner that is very accurate and only deals with unnecessary files, while providing useful safety nets to backup your some useful files in order to restore your such files back when needed. iMyFone Umate offers only 3 simple steps in order to reclaim your iDevice storage space back and have your iDevice working at the optimum rate. 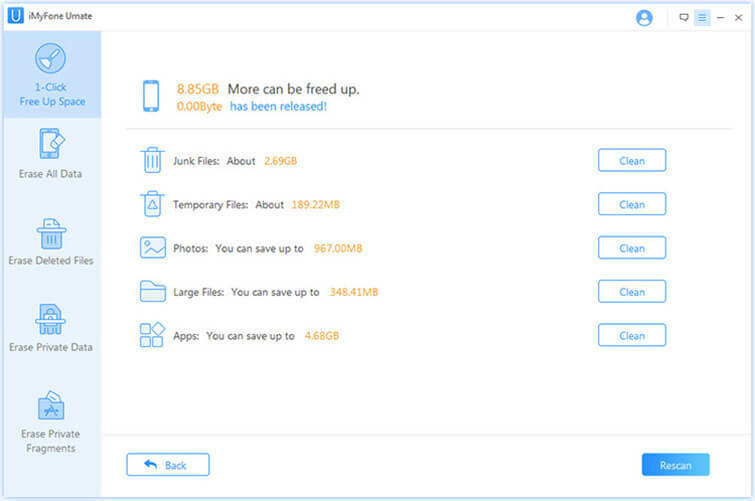 One click to free up space: iMyFone Umate has shown that "One click is enough" to regain your iPhone storage space back and have your iDevice performing at the maximum level. This would help to save your time when you are too busy to select files individually. This option also guarantees that you won't lose any of your important document because iMyFone Umate employs over 25 analysis technology in ascertaining the files that are important to you in order not to tamper with them. Remove junk files and temporary files: In actuality, iMyFone Umate has the potent technology to remove more than 30 types of junk files from iDevice. What's more, it can also delete temporary files. After scanning, deleting useless files with iMyFone Umate, you will definitely notice a great change in your iDevice performance. Compresses and backup photos without losing any: The beauty of iMyFone Umate is well shown in the ability of this tool to compresses photos without losing any. These compressed photos do not look different from the original. After compressing your photos, you will regain over 75% of your photo storage space back. Selective or batch cleaning large files: You may want to pick out the large files in your iDevice and delete them to regain more memory space on your iPhone, or you may like to clean up all useless and needless files in just one click. Anyone you are interested in, iMyFone Umate is there to help you accomplish that efficiently. We have compared some of these differences in the following paragraphs so that users can know them clearly. The availability of options and the simplicity of iMyFone Umate make Coolmuster a no match for it. With iMyFone Umate, you can do selective or batch cleaning, while Coolmuster offers only batch cleaning. iMyFone Umate can scan and clean up temporary files to save huge space for iPhone/iPad/iPod Touch, it is a remarkable feature. While Coolmuster doesn’t have this function. The efficient of these tools can also be ascertained through customer reviews and testimonials. iMyFone Umate users have very good things to say about the tool, but that is not totally true of Coolmuster.